Ruby Trichy Warriors is all set to take on Karaikudi Kaalai on Friday, July 27, 2018. 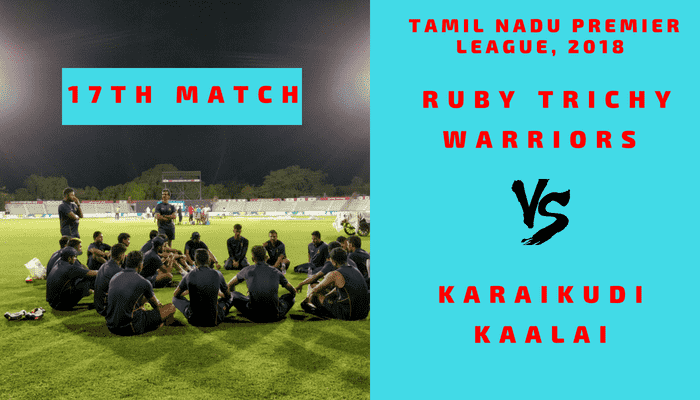 Ruby Trichy Warriors and Karaikudi Kaalai, both the teams have won two matches each. RUB has lost their last match. On the other hand, KAR has won their last two matches back to back. In Today’s Dream11 Fantasy Cricket Match of RUB vs KAR 17th T20, TNPL 2018, we will cover Pitch Report of Indian Cement Company Ground, Tirunelveli, Probable Playing 11, Toss Prediction, Fantasy Cricket News and Who Will Win? Who Will Win the 17th T20 Match, Between RUB vs KAR and Toss Prediction? Where Can You Watch the Live Streaming of RUB vs KAR, 17th T20 or Channels to Watch? Ruby Trichy Warriors has played three matches, won two and lost one. On the other hand, Karaikudi Kaalai played three games, won two and one game was a tie. KAR seems to be a strong team and they have a better chance of winning. According to our astrology prediction, KAR will win. The team winning the toss has opted to bat on this ground so far in the this Tamil Nadu Premier League, 2018. The trend will continue in this match also. The team winning the toss will opt to bat first. According to our astrology prediction, RUB will win the toss and ask KAR to bowl first. Date: The match will be played on the 27th of July 2018 (Friday). Match: Tamil Nadu Premier League, 2018, RTW vs KK, 17th Match. The pitch of Tirunelveli, Indian Cement Company Ground is expected to be neutral and will favour all three departments. The one who will bend their back the most will get the maximum benefit. In short, the wicket will favour the batsmen, seamers and spinners all three. The wicket is expected to slow down in the latter half of the game. It is expected to be partly cloudy and it will be the same throughout the day. The sun will play hide and seek. The cricket fans and fantasy users can see the complete game as there is no sign of rain. It is expected to be a hot and humid day. The temperature is predicted to be 31-Degree Celsius and the humidity to be 59%. Note: The weather condition may help the seamers. Ruby Trichy Warriors and Karaikudi Kaalai have faced each other twice and on both the occasions, KAR has defeated RUB. Trichy Warriors failed to register a single win against Idream Karaikudi Kaalai. In the last encounter, KAR defeated RUB by 6 wickets with 7 balls remaining. Bharath Shankar, Baba Indrajith and Suresh Kumar are the key performers of Ruby Trichy Warriors. RUB played with an unchanged team so far in this tournament and it is expected that they will go with the same team unless there is no fitness issue. Suresh Kumar, MS Sanjay, Chandrasekar Ganapathy, S Aravind, Baba Indrajith (c), Lakshmi Narayanan, Bharath Shankar, K Mani Bharathi (wk), Dakshinamoorthy Kumaran, Kannan Vignesh, R Sonu Yadav. Suresh Kumar, Lakshmi Narayanan, RS Thillak, Murali Vijay, Dakshinamoorthy Kumaran, V Aakash, Chandrasekar Ganapathy, Saravan Kumar, DT Chandrasekar, Aswin Crist, S Aravind, Baba Indrajith, Sathiamoorty Saravanan, Govinda Raajan, Bharath Shankar, MS Sanjay, Lakshminarayanan Vignesh, K Mani Bharathi, R Sonu Yadav, Kannan Vignesh. Srikkanth Anirudha, Maan Bafna and Yo Mahesh are the key performers of Karaikudi Kaalai Team. Srikkanth Anirudha was injured but he is expected to play as he is recovering fast. They may play with the same playing 11 as they will not try to disturb the winning combination. L Suryaprakash, V Aditya, Yo Mahesh, R Kavin (wk), Srikkanth Anirudha (c), Rajhamany Srinivasan, Velidi Lakshman, S Mohan Prasath, M Shajahan, Maan Bafna, R Rajkumar. L Suryaprakash, Dinesh Karthik, T Ajith Kumar, Yo Mahesh, S Ganesh, Srikkanth Anirudha, Rajhamany Srinivasan, S Kishan Kumar, S Radhakrishnan, Ashwath Mukumthan, S Swaminathan, Velidi Lakshman, Maan Bafna, R Kavin, S Mohan Prasath, M Shajahan, V Aditya, P Murgesh, R Rajkumar. Fantasy Cricket Expert Tips: Both the players are good. You can take anyone. 82.22% of the users have selected K Mani Bharathi in their Dream11 Teams and 17.78% of the users have selected R Kavin in their Dream Teams. Conclusion: This is it for Today’s Dream11 Fantasy Cricket Match Prediction of RUB vs KAR, 17th T20 Match, which will be played on Friday 27th July. We have covered all the details required to win any fantasy leagues. We have covered players recent and past performance, dream11 guru and crictom prediction, all the latest news and updates of Ruby Trichy Warriors Team and Karaikudi Kaalai Team, weather report of Tirunelveli, dream 11 best teams, keys players, the best choice for captain and vice-captain, where to watch the live match of KAR vs RUB, 17th T20 Match and the details of live streaming of Tamil Nadu Premier League (TNPL), 2018.